The Cathedral Choir is an ecclesiastical choir that sings for the Sunday Divine Liturgies and major feast days throughout the church calendar. The choir maintains a greater than forty year-old tradition of presenting a Christmas musical program to the Denver community. This annual program has expanded to include the Angel Choir (pre-school and grade school), St. Cyril Junior Choir (middle school and high school), the Bell Choir, and the Greek School. After Christmas, the choir adds a wider variety of music to their program and travels throughout the United States to promote fellowship and showcase the talent of our Greek-American composers. When possible, the choir also makes concert appearances during the parish’s summertime Greek Festival. In 1993, the choir represented the Archdiocese of America in a summer tour of Greece. Click here to view a map of the choir's past tour locations. The choir has made several recordings of Greek Orthodox liturgical music, including settings of the complete Divine Liturgy arranged by contemporary church musicians. These recordings are often used as music tracks for Archdiocesan video programs. The choir itself has appeared live on national and local television programs. The Orthodox hymns and chants presented in concert are representative of those sung throughout the entire liturgical cycle. While preparing for concert performances, the choir learns all the hymnology encountered during the year. Additionally, a variety of sacred music is offered to challenge the choir and promote greater musicianship. Dr. James N. Maniatis, D.D.S. 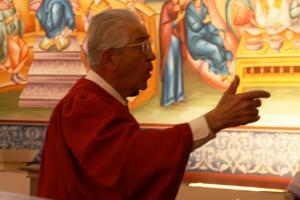 The choir is directed by Dr. James N. Maniatis, D.D.S. Dr. Maniatis is assisted by Dr. George T. Demos, M.D., Chrysanthy Therianos, and by accompanist, Connie Maniatis. The late George T. Demos, MD, was a retired Otolaryngologist-Head and Neck Surgeon in Denver. He studied music composition and choral conducting at the University of Denver and studied Greek Orthodox choral music with Frank Desby, Tikey Zes and Theodore Bogdanos. He was the Assistant Director of Music at the Assumption Greek Orthodox Cathedral in Denver until his passing and had also directed Greek Orthodox choirs in Atlanta, San Antonio and Spokane. He was a past President and Editor/Publisher of the Denver Choir Federation. He edited and published the “Byzantine Liturgy: Hymnology and Order,” by Dr. Theodore Bogdanos. He was the second National Chairman of the National Forum of Greek Orthodox Musicians and directed the Endowment for the Chrysanthos Chair of Byzantine and Church Choral Music at the Holy Cross Seminary. Dr. Demos was honored with the presentation of the St. John of Damascus Award and the St. Romanos Medallion. He had been honored by the Greek Orthodox Church nationally with the presentation of the Archbishop Iakovos 30 Years of Service Award. The Patriarchate of Constantinople honored him with election as Archon of the Knights of St. Andrew. Chrysanthy Therianos was born in Denver to Jim and Connie Maniatis and was introduced to music at an early age. She sang with the Meistersingers while attending Cherry Creek High School and toured the People’s Republic of China. She studied voice and piano at St. Olaf College in Minnesota, receiving her Bachelor of Arts degree in Music Education. Chrysanthy sang and toured with the renowned St. Olaf Choir under the direction of Kenneth Jennings. She has conducted both adult and youth choirs in Minnesota, New York, Oklahoma, Texas, and Germany. An accomplished pianist, she continues to study under the tutelage of concert pianist, Rodney Mobley. Chrysanthy and her sisters, Presvyteres Stacey Dorrance and Marika Brown, have performed as the singing group Eikona since 1992. She is married to USAF Lt. Col. Michael Therianos. While the family was stationed in Aachen, Germany, she studied Byzantine chant under Stellios Kanonis. The Therianos’ and their four children now reside in Colorado Springs, Colorado. Click here for EIKONA website. The Greek Orthodox Metropolis of Denver Church Music Federation, with headquarters in Denver, Colorado, was founded in 1975 as the Federation of Greek Orthodox Choirs of the Western States—East. Click here for more information about the Church Music Federation.